Next morning, having exumed the little Alfa from its sepulchral retreat, we continued north to Padua along roads lined with enormous poplar trees. We repeated our practice of ploughing into the old city centre and stopped beneath St Anthony's historic and rather crumbling 7-domed basilica and explored the nearby monumental square which we thought a good spot for a future Alfa gathering. 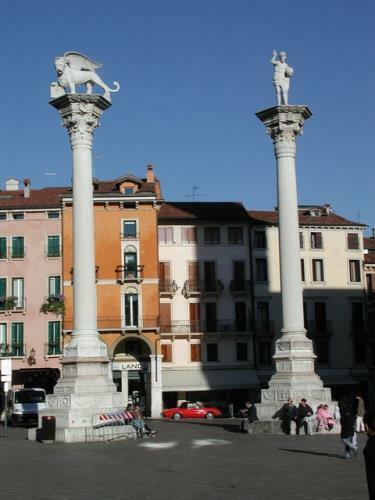 We departed north west on the SS 11 for Vicenza - the 'city of Palladio' - and parked again in the heart of the ancient city, in the shadow of the monumental paired columns which border the magnificent Piazza dei Signori. Palladio's famed C16th Basilica and Loggia del Capitano were on this square and were explored at our leisure in the afternoon sunshine before we booked into the old 2 star Hotel Vicenza located nearby. Before parking up for the night, there was another Palladian building that had to be seen - the Villa Rotunda - and viewing was urgent! We were in Vicenza on the last day of 2003 that this building was open - 15th October - and it closed at 6pm. Negotiating Vicenza's one way streets out to the "Rotunda" left us just time to explore this masterpiece that has so many copies round the world - including at Chiswick House. The gated drive to the Villa Rotunda is cobbled, straight and steep. As I ascended - on my crutches - I thought this altogether unsuited to the carriages of its 16th Century guests and speculated whether Cardinal Capra - the Villa's commissioner - found this to be a problem; his aristocratic guests could never have been expected to approach on foot! But as we, the final visitors of the year, were leaving on the same precipitate path, I had my answer. From somewhere behind the Rotunda's symmetrical porticos emerged a late series Alfa Romeo 164 with the building's cultured and elderly steward at the wheel. In an impressively stately manner, driver and car descended this cobbled scarp and made their exit, illustrating conclusively that, indeed, noble carriages can reach - and leave - the Villa Rotunda with all the decorum demanded by an Italian gentleman! And rarely can a 164 have been recorded in a more mutually enhancing setting than in my photographs of this notable event! After then visiting the nearby Villa Valmarana, we re-entered Vicenza as it was getting dark. We wound our way back into the centre but found ourselves at the opposite end of the Piazza dei Signori and separated from our intended parking place by a 'no-go' pedestrian area. We asked of a passing policeman directions to reach the far end but instead he indicated that we might park in front of the central Post Office that was adjacent to us. This location was close to our hotel so we were pleased to leave our Spider there, parking beside a Mercedes coupé that was also displaying a 'disabled user' card. Before breakfast next morning we decided to check that the Spider was safe. To our horror and disbelief it had vanished! In its place was a vendor of antiques - very droll - and all around were massed market stalls and throngs of shoppers. Hoping that my Alfa may have been simply moved aside, we scoured neighbouring streets but instead found that the market spread all around, completely filling the Piazza dei Signori which had been transformed from the tranquillity of the previous day into a chaotic hubbub. With breakfast forgotten, we hastened back to the hotel to seek assistance. Showing initially a marked lack of concern that contrasted strongly with ours, the receptionist riffled rather languidly through the Vicenza phonebook, uncertain as to which municipal authority might have taken my car. But as she better understood the circumstances she rapidly warmed to the task and when she located where the Alfa was impounded she proceeded to argue our case enthusiastically and repeatedly to increasingly senior personnel. It was late morning by the time a taxi was called to take us to the car pound where I reported to the desk. After a short time a senior manager arrived, a friendly hirsute giant whose appearance suggested a possible Norse lineage. He explained how the city's contract with the market traders meant that streets had to be cleared but how, in our case, the extenuating circumstances meant impoundment expenses were being waived. So saying, with a flourish of initials, and to my great relief, he expunged charges of over 100 Euros on the municipal impoundment register. Furthermore, he said, as we walked to collect the Spider, what a pleasure and surprise it had been to see our wonderful car when he arrived at work that morning! - what year was it? 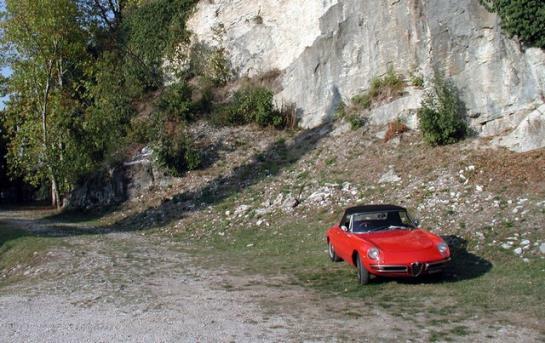 - he himself had a 1968 Lancia Fulvia - what are you doing with the car here? … Thus the discussion moved to pleasanter matters! However, our new-found Lancia-owning friend explained, there remained the fact that we had committed a parking offence - albeit inadvertently - and in order that we may address that quite separate matter, officers from the Polizia Municipale were about to arrive. We were required to follow them to Police HQ - Don't worry, he said, I expect they are inviting you over for coffee! Soon Dave was steering the Alfa into the heart of the city once again, but this time pursuing a police Fiat to the Polizia Municipale Vicenza. 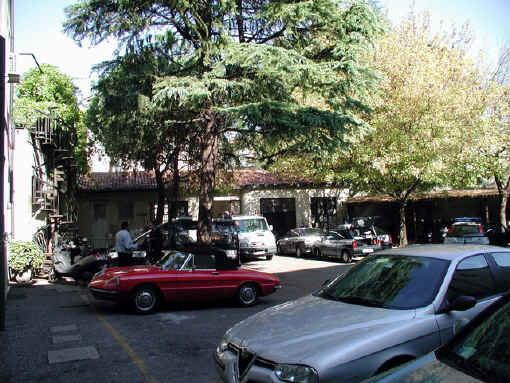 The Police HQ occupies a former Palazzo located on the Contra Soccorso Soccorsetto and there we followed the Fiat beneath the palace's Renaissance arch into the tree-lined court that now serves as the police yard. We were escorted in to meet the Capitano, Claudio Sartori, and another senior officer, Stefano Riello. It quickly became evident that, although the Officers were sympathetic and appreciated the circumstances, an offence had, inescapably, been committed and a fine would have to levied. Furthermore because I was a foreign visitor, the fine would have to be paid immediately. The whole process was most politely handled and my fine - 33.6 Euros - was receipted by the Commune di Vicenza Comando Polizia Municipale. With formalities thus complete, Dave and I proceeded with the Capitano and his Officer to the police bar, where we talked about our visit to Italy and the interesting people we were meeting. There, too, we were refreshed by some freshly brewed coffee - our friend at the municipal car-pound had proved correct after all!